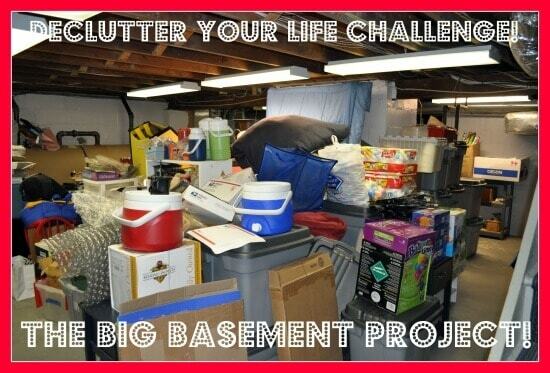 The Declutter Your Life Challenge: The Big Basement Project! This area is the perfect example of good intentions gone bad! In my attempts to try to keep the upstairs living areas of our home neat and organized, I used the basement as the “giant closet”- the one that I stuffed everything into that we didn't need to access on a regular basis. And that's how this room became known as the basement dumping ground. It's time to streamline people. So let's start by having a look around, shall we? Welcome to the land of “things the we want to keep around just in case we might need it” and “things we once loved but don't know what to do with now”. 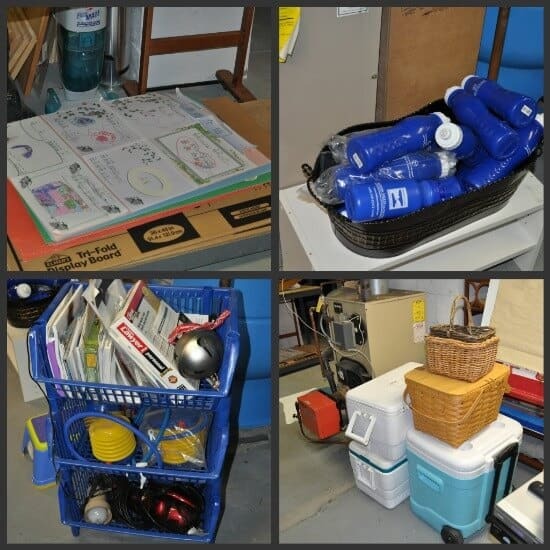 Items that might make good candidates for kids art projects such as shoe boxes, baby food jars, and bubble wrap all come to live here. As well as last year's giant Halloween costumes…. There's a fair amount of furniture stored down here that we don't use- a single bed headboard, footboard and side rails that was traded in for bunk beds as our family grew, a set of nightstands that go along with the boys bedroom furniture but no longer fit in their rooms once we realized that we would rather have bookshelves and desks for the kids. There are two coffee tables, three large area rugs, and several large chairs. None of these things are being used…. but they are “too good to throw away”…. and maybe we might put them into service again some day. All of our holiday decorations live down here. And maybe one or two other things…. Some stuff stacked high….. some stuff gathered in little piles…. But this basement can no longer be the dumping ground of the Rowley household! Either the stuff down here is truly usable and worth keeping, or it needs to find a better home. I am ready to get started! What is this room's true purpose? Well this is a basement… an old one with low ceilings, with exposed wires and pipes, and the place where most of our home's mechanical systems live. This is a room meant for storage. And with a family of 8 people… there is always going to be plenty of things that need to be stored in an area that is not part of our home's active living space. But there needs to be some structure here, and some rules about what is worth storing and what should be streamlined in our home. Once an item is down here, it needs to be organized so that any of us can locate it and use it when we'd like. The good news is that there is some light at the end of the tunnel. A place to start. A small corner of the basement that hasn't yet been filled to the brim… a corner that would be the perfect location to store the furniture that we would like to keep in the long run, which will open up the main area of the basement and create some space to store the vastly streamlined items that are also worth keeping. So the first phase of the Big Basement Project will be to sort through the furniture that we want to keep, move it to this small corner of the basement which will open up space for phase two… the true decluttering and organizing of the rest of our “stuff”. So as you can see, I have my work cut out for me this month. There are more than 12 years of accumulation buried down here! 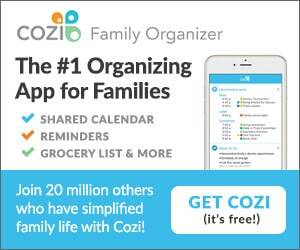 Now that I have exposed to the world my most shameful decluttering and organizing challenge…. I'm going to ask you: What's one area in your own home that you would like to tackle in the next 29 days? It certainly doesn't need to be as huge as this project. 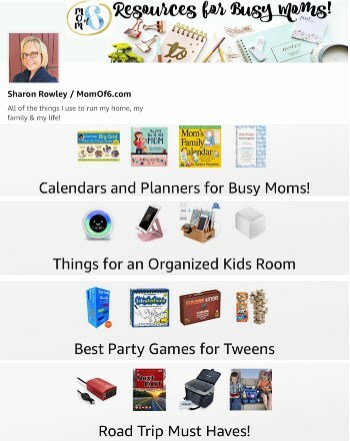 Do you have a closet or even a drawer in your kitchen that needs help? Then join me here! Leave a comment with what you are committing to declutter in the next 29 days- or head over to Org Junkie and link up your project too! We can do this! 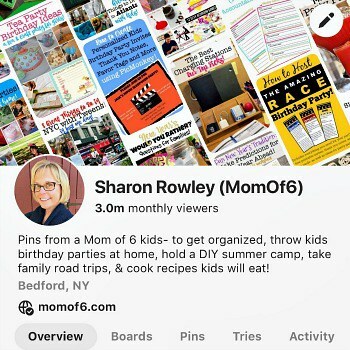 Wow — you’re taking on a big project! 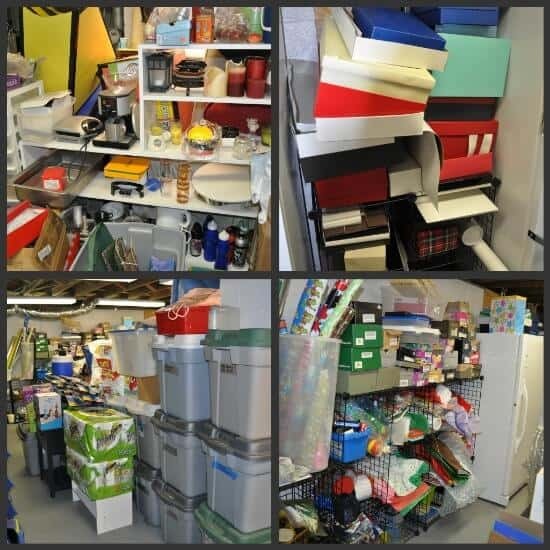 It looks like you’ve done a fair amount of organizing in there already — I’d purge like crazy: sections like the (empty?) gift boxes could be repurposed as organizers or just recycled to free up space. Best of luck! 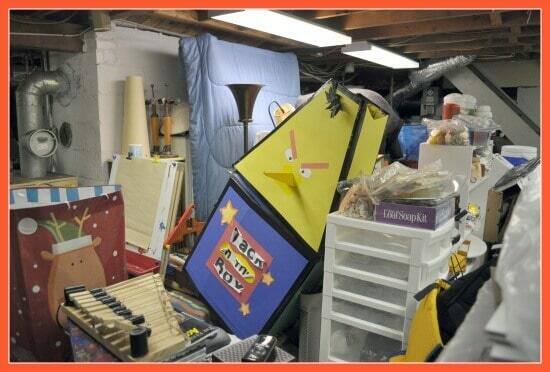 Now you’ve inspired me to tackle my garage…I’ll clean until I see the first black widow. Yep- it’s one BIG project! The reason why we keep empty shoes boxes and containers is so that we will have them on hand when we are looking for a small container that can be used to organize a drawer or a shelf, etc. The problem is… we are keeping waaaayyy too many! I’m glad I’ve inspired you to tackle the garage….. let’s hope the spiders know to clear out now! Thanks Laura- I am so glad you checked it out! I do plan to take pictures of the purge piles…. but I am hoping for multiple pick-ups in order to get the clutter flowing! 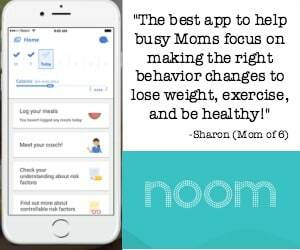 Thanks for putting together this great challenge- you’ve certainly inspired me to tackle this huge project that I have been ignoring for years! Yep. I have a basement that looked a lot like that until a couple of weeks ago. I wouldn’t say we’re finished organizing (and throwing out my husband’s out of date computer junk) but we’re definitely moving in the right direction. Good luck in your decluttering! Thanks Stephanie! So funny that you mentioned the computer stuff. I just spent the last hour down there cleaning out piles of old electronics that had been put down there because we weren’t sure of what to do with them. And then today I researched it and found out the our town now recycles e-waste. So I have a nice pile now pulled together to take over the the recycling center this weekend! Bit by bit I’m going to get this done! The only reason my basement doesn’t look like that is that it’s a finished basement. My craft room bears a striking resemblance though. Good luck with the challenge! Thanks Mel- and good luck to you too! If my basement were finished- it would probably still look exactly the same as it does now… just with nicer walls and ceiling! The stuff has gotta GO! I’m tackling my basement storage too! I will be following your progress and hopefully we can share ideas!! Awesome Lisa! I am going to check out your blog now! Sharon – looks like a C&M Pick up will be in order:) or the Fox Lane HS Wellness Committee is having their annual tag sale on March 10th. Good Luck! Thanks for cheering me on! I will be updating the blog with my progress over the next few weeks…. so “stay tuned”! Tina you are SO not alone! I cannot wait to declutter this space and make it functional for my family again! 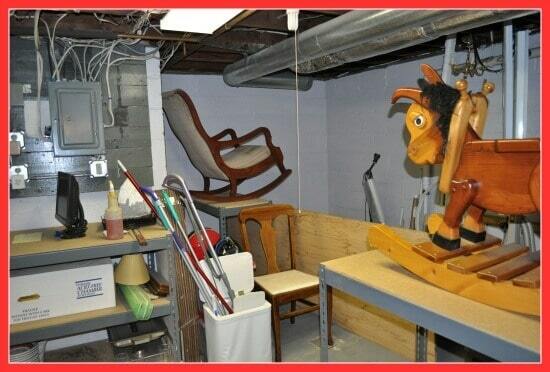 Thanks for showing these pictures so I know I am not alone on the world with the basement as a dumping ground. I am so excited to finally start this project!! !